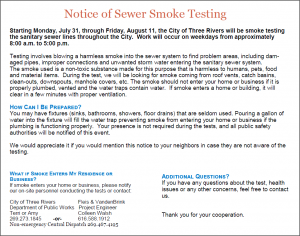 Starting Monday, July 31, through Friday, August 11, the City of Three Rivers will be smoke testing the sanitary sewer lines throughout the City. 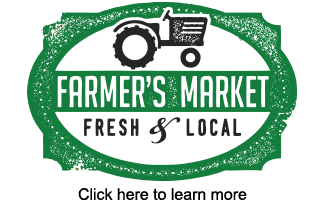 Work will occur on weekdays from approximately 8:00 a.m. to 5:00 p.m.
pipes, improper connections and unwanted storm water entering the sanitary sewer system. clear in a few minutes with proper ventilation. authorities will be notified of this event. your neighbors in case they are not aware of the testing. WHAT IF SMOKE ENTERS MY RESIDENCE OR BUSINESS? ADDITIONAL QUESTIONS? If you have any questions about the test, health issues or any other concerns, feel free to contact us.